Manufacturer of a wide range of products which include high accuracy load cell, multi axial load cell, shear beam load cell, s-type load cells, button type load cell and load cell for web tension. This Load cell is used as Master Load cell for Calibration of Load cells and other force/Load measuring device or sensors. Monad High Accracy Load Cell is calibrated with the use of dead weights and high accurate standards. Monad Electronics Multi Axis Load Cells are designed to measure a multiple of forces and moments simultaneously with a single Load Cell. Multi Axis Load Cells can accurately measure up to six components (3 forces and 3 moments) of load. For example, Independent strain gauge bridges are used to measure three directions of force: Longitude, Latitude, and Vertical, as well as, the moments about each force direction. Separate receptacles or cables are provided for each axis of measurement. A careful structural analysis has been done to isolate the forces and moments, which results in a reduction of cross-talk sensitivities. All designs are one piece flexures, machined and gauged to give optimum output, stiffness and durability. One of our innovative designs, the Stick Shift/Gear Shift Knob Transducer offers a lightweight, robust feature and comprised of stainless steel. Monad Advanced Sensor Technology Multi Axis Load Cells offer a variety of ‘flexible’ mounting options comprising of threaded center holes for ease of fixturing, and various signal cable exit options (radial or axial). Our meticulous approach to the design of our Multi Axis Load Cells has given us a product line that can be used for impact testing, measuring rolling resistance, bolt load testing, tire testing applications, etc. Monad Electronics Advanced Sensor Technology sensor applications are as broad as its Multi Axis Load Cell capabilities. 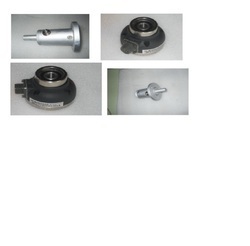 May be used for fatigue testing machines, tire uniformity testing and many other automotive testing applications. Monad Electroncis, shear beam load cells ideally suit all industrial weighing scale and general measurement applications. Applications include filling machinery, industrial floor scales, tank and silo weighing plus diverse applications in on board vehicle weighing, medical equipment and process control. Economic solutions use modern sealing compounds sufficiently durable for most applications, ensuring optimum performance in all types of weighing applications as well as a broad range of high precision measuring electronics. The stainless steel beam type load cell with an improved potting. It is suitable for use in industrial environments. Monad Electronics S-Type load cells (Tension/Compression) are low-cost and high performance load cells suitable for a number of weighing and general force measurement applications. Available in standard and metric, the S Type Load Cell series provides accuracy, compact design features, overload protection. S Type Load Cells are also commonly known as Z Beam Load Cells or S Beam Load Cells. 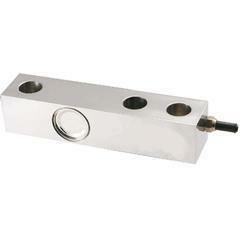 The S Beam Load Cell is available in variety of load ranges with both English & Metric threads. It is very popular due to its high precision, low price, and ease of installation. But since S Beam Load Cells are strictly designed for in-line applications they are very sensitive to extraneous load, torque, and moments. Off center loading must be avoided for the best performance & longer service life. Button type load cells are designed for compression Loading, Press, or Inline compression and known for their small package size. They are used in tight and limited spaces. Commonly used in applications that requires high precision and less sensitive to load condition. Button type load cells from Monad Electronics are shock and vibration resistant and feature robust electrical connectors to stand up to the most severe operating conditions. Monad Load Cell for Web Tension measure web tension forces applied across a roll, using integral horizontal and vertical axis sensors. This innovative and exclusive two-dimensional approach to web tension force measurement enables accurate determination of the true resultant force, as well as the applied angle. Not only does this permit installation and measurement at any mounting angle or roll orientation, it also combines to form an expert diagnostics system that produces the highest level of web tension measurement confidence available today. The Load ecll is machined from a high strength corrosion resistant stainless steel to yield a low profile single piece construction that incorporates tubular sensing sections at each end. The Fatigue Rated Load Cells are similar to the Universal Load Cell models and are designed for fatigue measurement/control applications in both tension, compression and/or tension/compression directions. The load cells possess very low deflection, high natural frequencies, and a one billion cycles fatigue rating! Monad Electronics, Fatigue rated load cells are specifically designed for component durability and fatigue test machines where highly cyclical loading is present. These rugged load cells are extremely resistant to extraneous bending and side loading forces. They are used for material testing, component life cycle testing and structural testing. All fatigue rated load cells are guaranteed against fatigue failure for 100 million fully reversed cycles. Monad Fatigue load cell comes with, low profile, 150% static overload protection. Constructed of stainless steel typical applications include bolt force measurements, clamping forces, monitoring overloads post or leg mount, and rolling mill systems. If you need special modifications or a complete custom design to meet your unique requirements, please don’t hesitate to contact us. 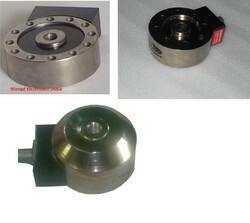 Monad Donut Load Cell series also offer high accuracy and high stiffness. Clevis pin load cell are uniquely designed for applications where clevis pins, shear pins, shear axles, or pulley shafts are carrying a load. Typical applications include heavy-duty machinery such as cranes, hoists, conveyors, or any type of pinned joints. Clevis pin type load cells are manufactured to exactly replace the existing shear pin and provide real time force monitoring of loads carried by these types of devices. Clevis pin type load cells from Monad Electronics are shock and vibration resistant and feature robust electrical connectors to stand up to the most severe operating conditions. Load Cell Force/Load Washer Type Transducers are miniature load cells designed specifically for measuring fastener clamping forces. The design provides high stiffness in a small package, making these load cells ideal for static and dynamic measurements on fasteners, or structural test applications where space limitations exist. 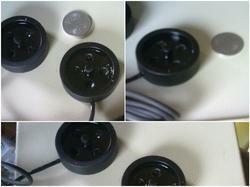 Force washer transducers come in a variety of English and Metric sizes. Monad Load/Force Load Cell Washer Type series also offer high accuracy and high stiffness. The Load/Force Load Cell Washer Type can be modified or customized to meet customer requirements. 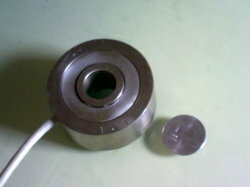 The Load Cells washer type can be used as a washer, sensing compression force, when utilized as a compression load cell.While choosing a flat washer, make sure that the inner diameter of the flat washer is less than the diameter of the inner ring of the load washer to insure that the active ridge is seated on the flat washer. Monad Electronics Pancake / Low profile Load Cells are commonly used in applications that require high precision, and less sensitive to load condition. For most capacities the Pancake Load Cell is normally designed with multiple shear struts. For lower capacities it’s designed with bending beams. If properly designed and manufactured, the nature of its structure is less sensitive to extraneous load and moments (especially Torque) compared to other inline sensors such as the S Beam Load Cell, diaphragm or column type. This type of Load Cell is normally used in press in compression for controlling the applied load or pressure during the test or production. Monad Electronics offers low profile, pancake style precision load cells constructed of stainless steel to provide rugged high performance over many cycles of testing, such as in material testing applications. Intrinsically safe and fatigue rated options are available. Jumbo (Auxiliary) Display is available with Monad which shall have visibility over a distance of 75 meters and above. Monad Through HoleLoad Cell series also offer high accuracy and high stiffness. Monad Thru (Through) Hole load cells feature a compact, smooth thru-hole design for use in applications which require the load structure to pass through the cell. Offered in either tension or tension/compression models, measuring load ranges from 150 g to 200000 lbs. 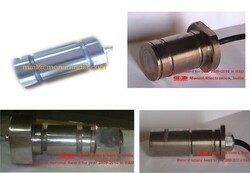 Monad Thru HoleLoad Cell series also offer high accuracy and high stiffness. Force Washer Transducers are miniature load cells designed specifically for measuring fastener clamping forces. The design provides high stiffness in a small package, making these load cells ideal for static and dynamic measurements on fasteners, or structural test applications where space limitations exist. 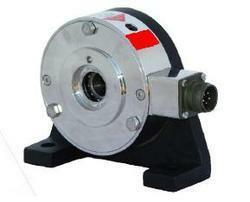 Force washer transducers come in a variety of English and Metric sizes. Monad Load/Force Washer Load Cell series also offer high accuracy and high stiffness. 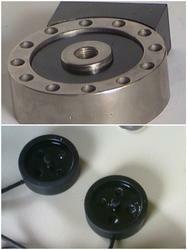 The Load/Force Washer Load Cell can be modified or customized to meet customer requirements. The washer type Load Cells can be used as a washer, sensing compression force, when utilized as acompression load cell.Whilechoosing a flat washer, make sure that the inner diameter of the flat washer is less than the diameter ofthe inner ring of the load washer to insure that the active ridge is seated on the flat washer. Force Washer Type Transducers are miniature load cells designed specifically for measuring fastener clamping forces. The design provides high stiffness in a small package, making these load cells ideal for static and dynamic measurements on fasteners, or structural test applications where space limitations exist. Force washer transducers come in a variety of English and Metric sizes. Monad Load/Force Washer Type Load Cell series also offer high accuracy and high stiffness. 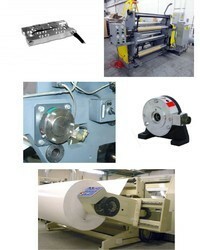 The Load/Force Washer Load Cell can be modified or customized to meet customer requirements. The washer type Load Cells can be used as a washer, sensing compression force, when utilized as a compression load cell.While choosing a flat washer, make sure that the inner diameter of the flat washer is less than the diameter of the inner ring of the load washer to insure that the active ridge is seated on the flat washer. Monad Web Tension Transducers measure web tension forces applied across a roll, using integral horizontal and vertical axis sensors. This innovative and exclusive two-dimensional approach to web tension force measurement enables accurate determination of the true resultant force, as well as the applied angle. Not only does this permit installation and measurement at any mounting angle or roll orientation, it also combines to form an expert diagnostics system that produces the highest level of web tension measurement confidence available today. The Load ecll is machined from a high strength corrosionresistant stainless steel to yield a low profile single piece construction that incorporates tubular sensing sections at each end. SW Series loadcells measure low resultant tension forces with small wrap angles. Designed for use in applications such as winders, unwinders, rewinders, coaters, laminators, and printing presses, they eliminate drift and frequent recalibration problems oftenencountered with conventional half-bridge semiconductor-type load cells. Full Wheatstone-bridge, temperature-compensated strain gage construction enables precise accuracy with genuine “non-drift” signal stability. 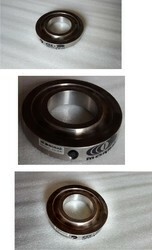 MWT load cells are of a ruggedcompact size with high overload capacity. Outline dimensions are identical to existingequipment, thereby making possible simple, drop-in replacement. 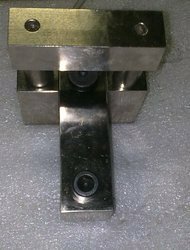 The Load cell is machined from a high strength corrosionresistant stainless steel to yield a low profile single piece construction that incorporates tubular sensing sections at each end. Two full Wheatstone Bridges are mounted internally to each sensor and provide] output signals in the X and Y plane hat are externally, vectorially summed to determine the magnitude and direction of the resultant force. Monad Tension link load cell has been designed for lifting and weighing applications in harsh environments. The load cell mounting assembly is designed to prevent overload loading of the load cell as well as lift-off protection. The Monad Digital Weight Indicator is mounted with battery backup. A Jumbo (Auxiliary) Display is also available with Monad which shall have visibility over a distance of 75 meters and above. Compression Through (Thru) Hole Load Cell Transducers are miniature load cells designed specifically for measuring fastener clamping forces. The design provides high stiffness in a small package, making these load cells ideal for static and dynamic measurements on fasteners, or structural test applications where space limitations exist. 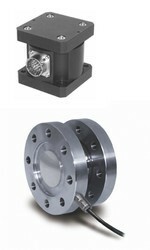 Force washer transducers come in a variety of English and Metric sizes. 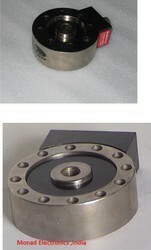 Monad Load/Force Compression Through Hole Load Cell series also offer high accuracy and high stiffness. 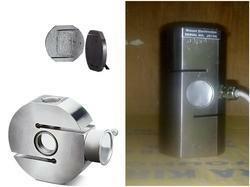 The Load/Force Compression Through Hole Load Cell can be modified or customized to meet customer requirements. The Compression Through Hole Load Cells can be used as a washer, sensing compression force, when utilized as a compression load cell. While choosing a flat washer, make sure that the inner diameter of the flat washer is less than the diameter of the inner ring of the load washer to insure that the active ridge is seated on the flat washer.